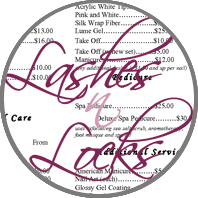 Lashes 'n' Locks offer a complete spray tanning course in total privacy from our tanning studio in Hereford. Nicola is a qualified therapist and can tan your skin using a specialised low pressure spraying machine. The whole process takes less than 30 minutes yet lasts like a real tan for 5-7 days. 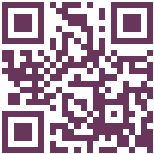 See our frequently asked questions for more details on Spray Tanning in Hereford. I will give you full details of how the spray tan works, from exfoliating the night before through to aftercare tips and tricks. Spray tanning can be applied as you wish at your discretion, with disposable underwear or by supplying your own. My private cubicle room allows complete comfort to enjoy your tanning session. The results of a fake tan speak for itself. Spray tanning is an incredibly popular beauty treatment, with extensive industry developments in recent years resulting in higher quality products and increased popularity. It has countless benefits over alternatives such as tanning from the sun or with sunbeds, and spray tanning with us is the healthier, skin-friendly option for those still wishing to achieve a sun-kissed look without the considerable risks. Whether you are after a warm healthy glow or a deep, rich tan that would rival ten days in the sun, as a Sienna X expert in Hereford I can help you achieve exactly the look you desire. Sienna X spray tanning - The solution contains the freshest and purest DHA, a combination which produces a realistic and streak free tan which is longer lasting than other tanning products. Blended with a gorgeous selections of natural moisturising agents, it will leave your skin soft and radiant as it looks. I'm a professionally trained and qualified Sienna X Spray Tan Therapist. This ensures you receive the perfect tan everytime. A spray tanning party is very popular and perfect for either a wedding, birthday or prom party, or just to get ready for a girls night out. 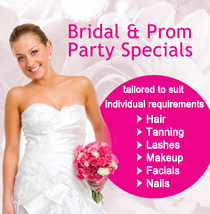 If you are a bride to be, and would like a spray tan party for yourself and your bridesmaids so you can all enjoy looking bronzed and fabulous on your big day or hen night, or if you would like your daughter and her friends to look stunning for their prom party, then I can help. Even men like beauty treatment. Grooms all want to look their very best on their wedding day, so why not book your other half in so that he will feel great and look healthy in those all important wedding pictures. Youll be surprised just how many grooms tan up for their big day. I researched many companies before deciding on Sienna-x , there spray tan is simple the best on the market. Sienna-x is the kind of strong, reliable partner that you want on your side. 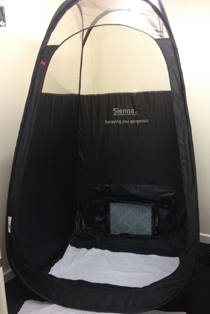 Sienna-x started out as the Spray Tan Cubicle Company, which was founded in 2004, initially selling amazing lightweight Pop Up Cubicles, which were designed and patented by our MD, Nicola Matthews. Due to the incredible success of the Pop Up cubicle and in response to demand from our customers, we added spray tanning equipment to our range later in 2004. As a result of continued expansion with the brand growing from strength to strength, Sienna-x relocated to larger premises in November 2004. Sienna Sun was conceived in 2005 - one of the first companies to introduce Paraben free retail products. Due to phenomenal growth following the introduction to the range of our exceptional quality tanning solutions, we moved premises. Sienna Sun underwent a total rebranding exercise in April 2007 and was re-launched as funky, pink and fun brand Sienna X. Sienna X has developed over the last 2 years to become a major force within the industry, with a high media profile and huge fan base.